The age-old concept and stopping to ask for directions has died off a bit, with the ubiquity of navigation devices. 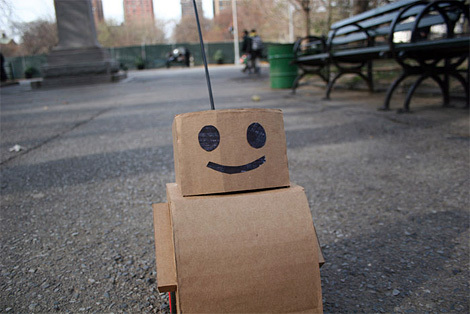 Kacie Kinzer's experiment with Tweenbot, a cute cardboard robot, reflects on the romantic notion of strangers helping strangers. Her experiment? Drop a robot, donned with a 'Help Me' sign, off on the northeast corner of Washington Square Park and see if New Yorkers will help it get to the southwest corner (as specified on the sign). It's just cute.